Nose: sweet, slightly lemony, some apple, slightly peated, slightly sweaty, but not unpleasant. I think the nose is quite acceptable. Could something go in the direction of young lighter smokers. Mouth: there he is, the peat, embedded in a peppery overall experience, vanilla, sweetness and a slightly tart, alcoholic touch at the end. Finish: slightly smoky, sweetish (slightly artificial), slightly maritime. 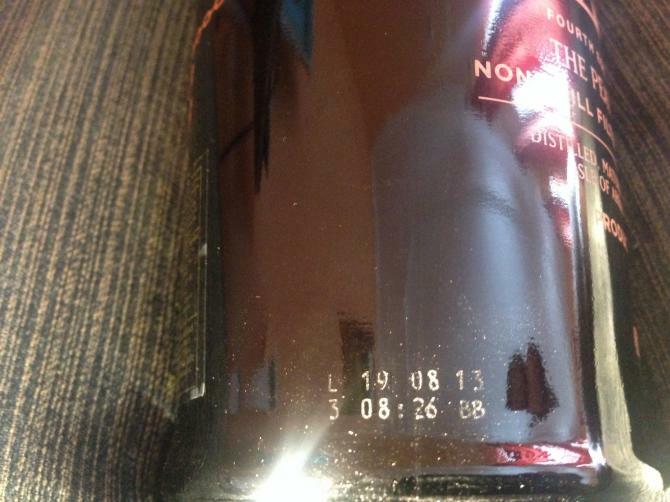 Nose: Smoky, plastic, standing in a glass, smoke disappears and citrus bitterness appears, salinity (peat). Empty glass: Sleepers, trains, creosote. Taste: A dead tree (does not repel), floral, but how do I know which flowers taste and which flowers or grass exactly ?! Aftertaste: Long, closer to long. Light, smoky, woody, firewood, apricots and white wine. Balance: good, but the smoke quickly goes away and the winner is the taste. Young, Green and mildly peaty. Everything is soft, but a bit immature. Overall it’s a bit light, but it’s nice. Peat, fruit, red licorice and orange. Light peat, fruit, citrus, vanilla, dark funk and an odd sweetness, more orange. Finish: Smoked meat, orange,vanilla and fruit. I liked the first two batches a bit better, the sherry influence in those balanced that saltiness which is so present in here a bit better. It's in line with the third release but even saltier. Orange, citrus, peat, salt, malt and peach. Orange, salt, peat, malt, pepper and vanilla. Salt, peat, malt, orange, chocolate and vanilla. 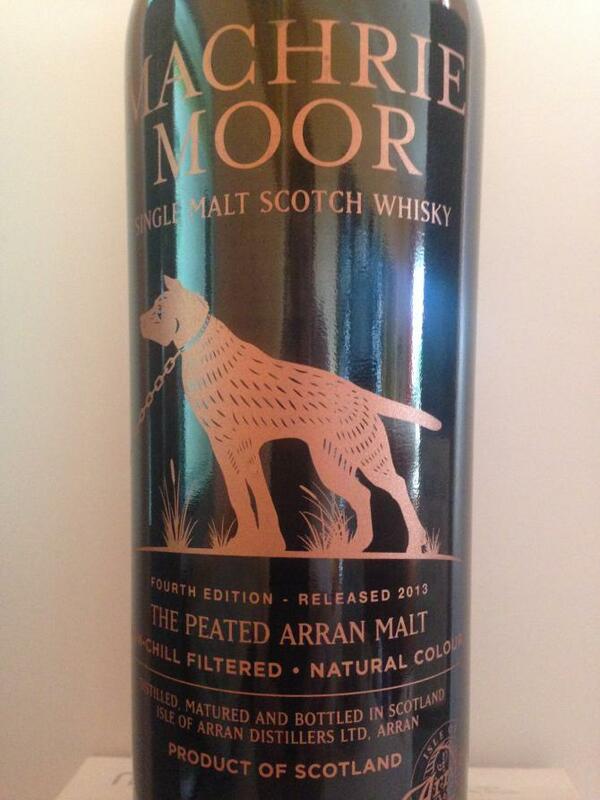 The Peated Arran. 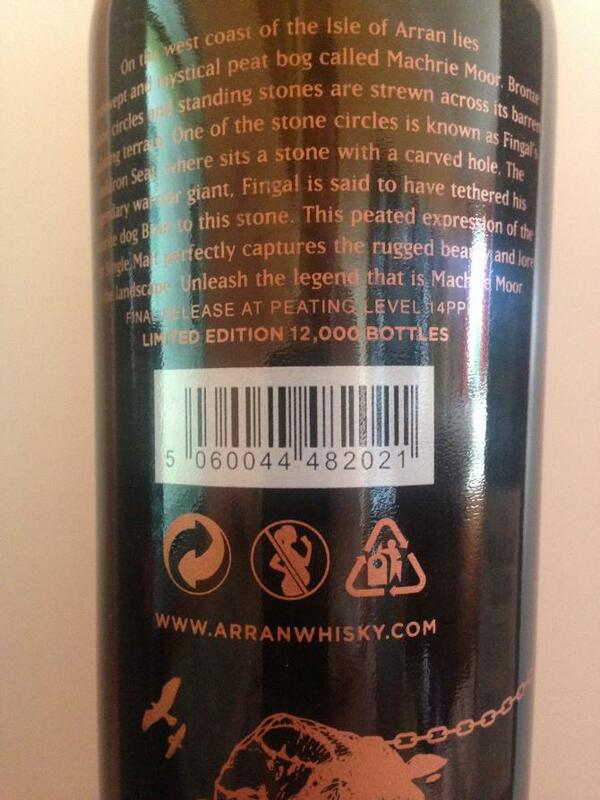 Lightly peated at 20ppm, this mythical malt has proved a popular addition to the Arran range. On the west coast of the Isle of Arran lies a windswept and mystical peat bog called Machrie Moor. Bronze Age stone circles and standing stones are strewn across its barren, undulating terrain. One of the stone circles is known as Fingal’s Cauldron Seat, where sits a stone with a carved hole. The legendary warrior giant Fingal is said to have tethered his favourite dog Bran to this stone. This peated expression of the Arran Single Malt perfectly captures the rugged beauty and lore of the landscape. 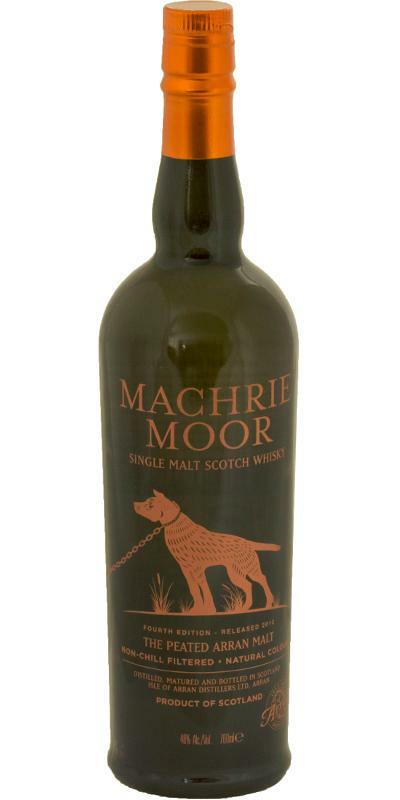 Unleash the legend that is Machrie Moor. Fresh and vibrant with an evident influence on an Ex-Bourbon Cask. Tropical notes of pineapple, peaches, and a distinctive coconut aroma dominate while a pleasant touch of peat reek in the background adds an interesting dimension to this vivacious combination. 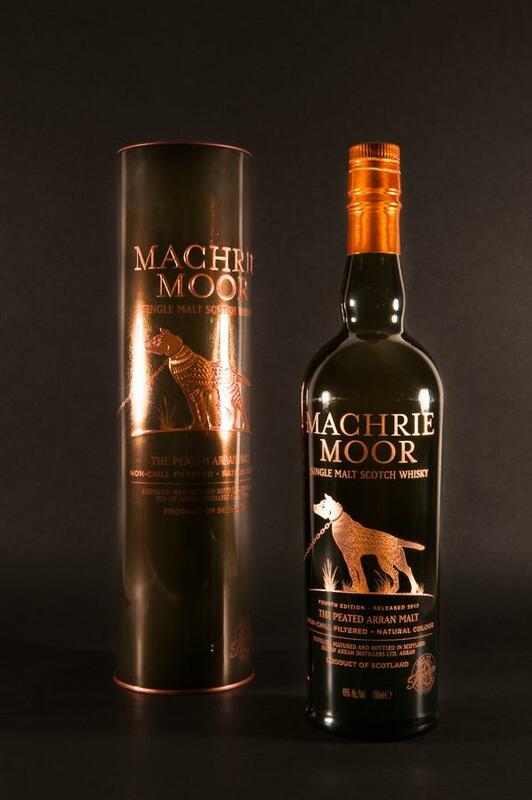 The palate gives a lot of citrus freshness that mixes beautifully with rich spice and a hint of peat smoke. A few drops of water reveal even more of the peaty smokiness that is wonderfully balanced by a delicious honey sweetness and vanilla. The finish is crisp and clean with lingering smoke and sweet vanilla. 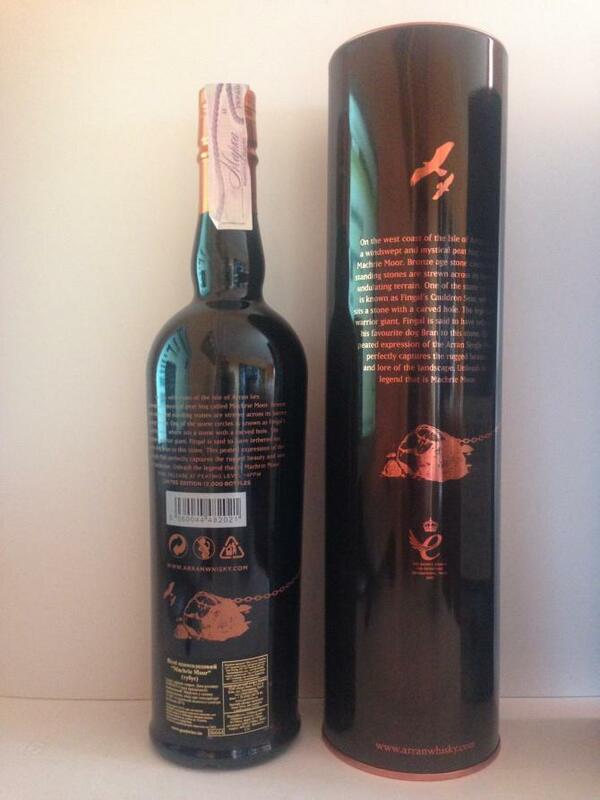 Dramfest 2014, single dram note.